Unlike the party apparatchiks, Jeremy Corbyn has consistently opposed austerity—and voters are enthusiastic. Stop me if you’ve heard this before: A grizzled left-winger with a bold anti-austerity message begins what everyone assumes is a quixotic quest for elected office. His campaign provokes an unexpected wave of public enthusiasm, drawing cheering crowds that embarrass his rivals, and inspiring hordes of previously disaffected young people. Yet the media continue to insist that as an unabashed socialist with no national executive experience, he remains unelectable, while senior figures in his party warn of dire consequences if voters refuse to grow up and settle for a politician whose coronation has begun to seem less inevitable with every passing day. For an American, especially, it is impossible to witness the growing excitement here over Jeremy Corbyn’s candidacy for the leadership of the Labour Party without being reminded of Berniemania. Though Corbyn, at 66, is more youthful than the 73-year-old Vermont senator, and entered Parliament as MP for Islington, in north London, back when Sanders was still in his first term as mayor of Burlington, the two mavericks share a reputation for putting principle ahead of popularity, a willingness to challenge their own party’s conventional wisdom—especially on the economy—and an improbable status as icons of authenticity in an age of sound-bite politics. But if you want to understand the roots of Corbyn’s appeal, and the painful dilemma he poses for the British left, you need to look past the gadfly-turned-Galahad story to the blasted landscape of the Labour Party, still reeling from its stunning defeat last May. With the next elections not due until 2020, Ed Miliband’s speedy resignation allowed the Conservatives, now in possession of a parliamentary majority, to throw off whatever concessions they’d had to make to their former coalition partners, the Liberal Democrats—cutting £12 billion from welfare, withdrawing housing benefits from 18-to-21-year-olds, and limiting low-income tax credits to just two children per family. As if to underline Labour’s moral and intellectual bankruptcy, when the changes came to a vote in July, Harriet Harman, the party’s acting leader, forbade her colleagues from voting against the government. Andy Burnham, a working-class Catholic with matinee-idol looks who led in all the early polls (and who was widely described as the candidate of the unions and the left), abstained. So did Yvette Cooper, who like Burnham had been a minister in both Tony Blair’s and Gordon Brown’s governments, and Liz Kendall, who though elected to Parliament in 2010 has become the Blairite champion in the race. The only leadership contender to actually vote against the latest Tory attack on Britain’s poorest was Jeremy Corbyn, whose dark-horse candidacy was initially viewed as mere window dressing, a gesture to placate the party’s fractious but impotent left wing. Indeed, Corbyn—who, in his previous 30 years as a serial rebel on Labour’s back benches, had never betrayed any hint of leadership ambition—scraped together the 35 nominations from sitting MPs required to get on the ballot only thanks to the support of several who publicly declared they’d be voting for one of his opponents. The plan was to provide Burnham—or Cooper—a “hard left” foil during the summer debates, and maybe add a little spice to a field described by one senior Labour MP as “like Ed Miliband without the charisma.” Unlike Sanders, who though elected as an independent has always caucused with Senate Democrats, Corbyn, titular head of the Stop the War Coalition, has never seemed comfortable inside any political party—not the various Trotskyist groupuscules whose causes he has supported and defended, without (so far as I can tell) ever joining any of them, nor the Labour Party itself, whose patronage and preferments he has refused. (During the 2009 scandal over MPs’ expenses, Corbyn was revealed to have claimed just £8.70 for an ink cartridge—less than any of his colleagues.) Yet from the very first televised debate on June 17, the odds on Corbyn, originally 100 to 1, began to shorten as audiences responded to his firm rejection of both Tory plans for another three years of austerity and the variations on austerity-lite offered by his Labour opponents. By the middle of August, Corbyn was so far ahead that one firm of British bookies had already begun to pay out on bets backing him to win. If elected, Corbyn has promised to end tuition fees at British universities, remove restrictions on borrowing so that local councils can build more public housing, introduce rent controls on private housing, and offer private tenants a “right to buy” from large landlords similar to the scheme Margaret Thatcher used to sell off public housing. Unlike Cooper and Burnham, Corbyn voted against the Iraq War; he also voted against authorizing air strikes in Syria, and has pledged not to replace Britain’s aging Trident nuclear-weapons system. A former left Euroskeptic like his friend and mentor Tony Benn, Corbyn now says he’d prefer for Britain to remain in the EU but argues that Labour needs to make sure Cameron doesn’t trade away workers’ rights and environmental protections when he renegotiates British membership. Alone among the candidates, Corbyn favors taking Britain’s railways and energy companies back into public ownership—two “radical” proposals that have long been backed not only by Labour Party members, but by a majority of Conservative voters as well! And while Burnham began his campaign by conceding that Labour had lost the argument on the economy—“We have to start by admitting that we should not have been running a significant deficit in the years before the crash,” he said—and Cooper stressed the need “to reset Labour’s relationship with business,” Corbyn was defiantly not on the same page. Instead, he has proposed a “People’s Quantitative Easing,” in which the central bank would electronically expand the money supply—but rather than use the newly created funds to buy Treasury notes (as in the original American QE) or bank or insurance-company debt (as in the British version), the proceeds would be used to build public housing and other infrastructure projects. (Note for wonks: Robert Peston, the BBC’s economics editor, critiques the proposal here, with a rebuttal from tax maven Richard Murphy here.) Although using public funds for the common good might pass for radical in some circles, and Corbyn had a kind word for Karl Marx as recently as last month, the underlying ideas here owe more to J.M. Keynes than to anyone else. The tiny handful of Corbyn’s backers from Socialist Action are outnumbered at least 100 to 1 by supporters from Unite (the country’s largest trade union), Unison (the second-largest), and a host of other unions representing everything from civil servants to firefighters to workers on the London Underground. And these, in turn, are dwarfed by the tidal wave of students, retirees attracted by Corbyn’s pledge to make adult nursing care part of the National Health Service, and ordinary voters delighted at the chance to vote for a candidate who understands that austerity isn’t working. Then there are—predictably, given Corbyn’s long record of support for the Palestinian cause—the accusations of anti-Semitism. Not against Corbyn himself, who is universally regarded as a thoroughly decent man. Instead the attacks are classic “guilt by association” tactics, in which Corbyn is alleged to have shared a platform with various objectionable characters whom he has then been pressed to denounce or disavow—by groups and individuals who have been happily doing Benjamin Net- anyahu’s dirty work for years. And, of course, there is the question of “electability.” As Bernie Sanders has shown, electability is a moving target: get enough votes to win the nomination, and you’re electable. Besides, anyone arguing that the trio of lackluster apparatchiks who have been rapidly outshone by Corbyn would be more “electable” if they were only facing a Tory opponent (overwhelmingly backed by the British media) instead of a rumpled, bearded, teetotal Marxist vegetarian obviously has an idiosyncratic understanding of the word. Which doesn’t mean there is nothing to worry about. Corbyn arrived in Westminster in 1983, the year the party’s manifesto was dubbed “the longest suicide note in history.” Yet just last year, in a column for the Morning Star (formerly the newspaper of the British Communist Party), Corbyn wrote that the 1983 Labour manifesto “would be highly appropriate today to deal with the finance and banking crisis.” His detractors cite this as proof that Corbyn is yesterday’s man, looking backward rather than forward. They may have a point. There is certainly something decidedly, even perversely, retro about his promise to reopen Britain’s coal mines. “We shouldn’t be talking about coal. We should be talking about decarbonizing the economy,” a Labour activist friend said. Even Corbyn’s call for Britain to leave NATO sounds less like bold new politics than a tired relic of 1980s anti-American groupthink. Disband NATO? Maybe. But leave? For what? 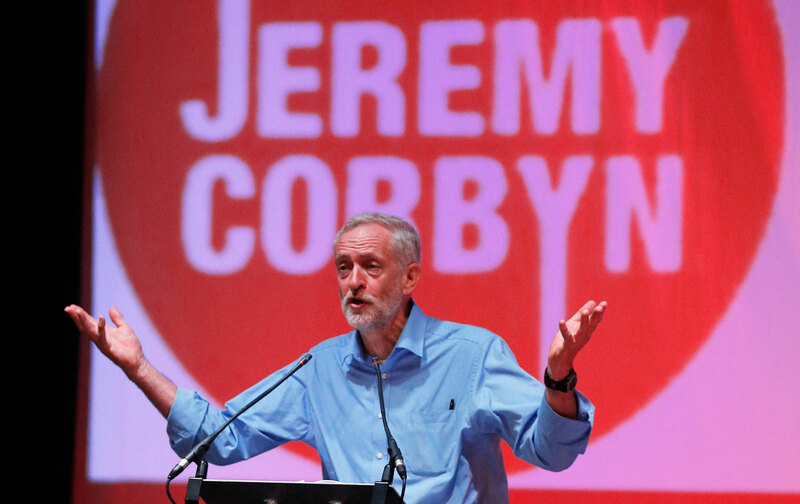 If Corbyn has a vision of a new, less militarized Europe, he’s kept it under wraps. Finally, there is the small matter of effective opposition. Opposing the government will be the new Labour leader’s primary task for the next several years. How will Corbyn, a man who has never even given lip service to party discipline, persuade his colleagues to unite behind him? Of the few sane reasons to oppose Corbyn, his manifest unsuitability to lead a parliamentary opposition is probably the most persuasive. Politics, however, is a long game. With five years until the next election, any hope of stopping the Tories will rely more on marches, demonstrations, and direct action than on votes in Westminster. Whoever wins in September might well be gone in a year or two. Meanwhile, the Labour Party is finally having the argument that Ed Miliband put off: about whom it claims to represent, and what kind of country it wants to build. And thanks to Jeremy Corbyn and his supporters, that argument has taken a surprising—and surprisingly radical—turn.